Tractor Additives: Black Label= Engine/Gear Treatment and Conditioner. Red Label= Fuel System Cleaner. White Label= Ring and Valve Cleaner. HOW to solve engine, fuel, or gear box problems with these 3 products. Once-impossible, negative internal engine and gear conditions formally remove by repair, can be chemically treated by the Mega Power items shown here. They will end your troubling performance problems, and get your truck, tractor, or equipment working great again, for years more trouble-free service. These 3 additives installed together in the fuel and motor oil, s change, dirty, wear roughen, trouble causing pistons bearings valves and gears back to clean, shinny smooth, and closely fitting again - ending the problem they cause. The Black Label Treatment is also added to gear boxes to remove their wear caused negatives. That's what ends operating problems. Over time, residues build and cover critical parts. Friction grows and with sticky residues add a strain to power development and over 21 problems appear. One of them is what you are here looking for a remedy for - and if you read this far, you need the products here suggested. You will want to add these new vehicle maintenance products to your problem-solving, expense-reducing tools. They will save you tens of thousands of dollars in now avoidable repair, replacement equipment expense. Our fuel, oil, and fluid tractor additives combine new friction-removing, acid neutralizing cleaners, power restoring conditioners, end costly-to-fix oil burning, power-loss, leak problems. Once-impossible to remove, power-robbing, problem-causing, friction & residues in worn motors, transmissions, and related components can be chemically treated to end your troubling performance problems and get your truck, tractor, or equipment working great again, for years on end. And do so in minutes, at a tenth of the cost of a $5000 + overhaul, and with no down time. That's good! Mega Power will end the, "Oh no! I knew the tractor was getting worst, problem. I really need this tractor to keep working - and not spend a week in the shop, until this job is done!" Is that your problem. The product you may need to end it is Mega Power. Tractor Additives from Mega Power. George Christ. 210 Durango St. San Marcos, Tx 78666. Call me now at 512 665 3388. To ask a question, to order products. Sometimes, wear causes problems years before you expected it to. When that happens, new tractor additives with new problem-solving advantages may be what you need - if you feel wear, worn parts, growth of friction, and residues are causing your problem. New Mega Power Anti-wear Tractor Additives will end wear, worn part, growth of friction, valve and gear and slave piston residue binding, and leak problems. In doing so, Mega Power will Restore Your Equipments Great-Running Dependibility a Repair Use To! New Mega Power anti-wear chemistry - called Treatments - because 2 week apart steps are use to make them work, contain new anti-wear cleaners, friction modifiers, and protective coatings - that work like medicine would help you recover, when ill. They are easy to install and produce guaranteed results, fast. Mega Power zeros-in to clean and free problem-causing internal piston, bearing, ring, valve, and related parts. At the problem area, Mega Power cleans and frees, removing maybe years of residue. 4 different cleaners go where oil cannot to do so. Next, Mega Power's MC+ [metal conditioners] smooths your wear-roughen surfaces that presently collect problem-causing varnish, or increase resistance to movement - or cause your leak, burn oil, lose power, grind, slip, etc - usually your problem cause. Next, the Treatment adds a slippery protective co-polymer to each and every part - closing up wear gaps. That shows you how beneficial the Mega Power cleaning and conditioning process can be to ending your tractor problem - an add years more service to all your equipment. Advantages NOT POSSIBLE to have BEFORE. No wonder that more equipment owners our including Mega Power to their regular oil and fluid changes. Doing so - after first, ending a performance problem listed here. Then deciding its cheaper to install Mega Power as a wear and performance problem preventative - at fluid changes - than chance future wear and residue problems taking control...... I can help you with both services. Shouldn't you be doing that to? Call now to order Mega Power advantages. Of course - "talk is cheap," you might be thinking. If so, each recommendation of Mega Power comes with a money-back 6 month guarantee. So, you have plenty of time to see what is so and what is not so. That is what's new! Note the before and after pictures showing problem-causing condition chemically removed. See the links belows for details and to learn more. Mega Power Tractor Additives clean up these parts and systems returning lost performance. Results occur in as little as 15 minutes. What do you mean, "Less expensive" - than what? User experience points out, Mega Power Tractor Additives, the product line we recommend, end wear and performance decline problems. Or puts their repair need off, sometimes for years. That's the help you want, isn't it? That advantage makes Mega Power cost way less expensive than any repair as a choice, if it does so - for you! Does it? Yes! I know what cost what. Most wear problems usually require dismantling, cleaning, and part replacement that can easily run $2000 to $5000 on your motor type. The product we promote - Mega Power, cannot fix what's broken. However, mechanics know, 95 out of 100 tractor motors - and all motors and transmissions, have a friction and residue build-up problem that develops into the need for those $5000+ overhauls. - and that, Mega Power can correct. How to end your equipment problem. What's do you receive in a Mega Power Engine Treatment? There are 5 precise tractor additives & cleaners found to end your equipment wear, end power-loss, leak, and poor performance. End oil burning and blowby motor problems. Restore compression & lost power, provide near like-new performance - it's true! That's what you get from Mega Power! Driving does the actual fix. Two gallons Mega Power MC+ Diesel Motor Tractor Additive. One gallon MP Cleaner Conditioner Treats to 10 gallons crankcase motor oil. Two gallons if loss of compression, blow-by, oil burning. One gallon Mega Power Motor Valve, Engine, Oil Side Cleaner - with MC+ Friction Modifiers. Add 1/2 gallon to oil now. Remaing amount 1/2 hour before an oil change..... Shipped to your door by FedEx in 3 days. Includes directions, tips, Guarantee, personal phone help. Price: One Mega Power Motor Treatment 5 items. $400 plus $50s&h= $450= Total for 5 gallons. State side. Add $100 shipping for Canada/Alaska/Mexico for $550 total shipped to you. I'll email or call for $100 extra shipping approval. 10 gallons in 2 5 paks. $600+ $50 s&h= $650 total. Save $200. Add shipping for Canada/Alaska/Mexico. I'll email or call for extra shipping approval. 6 pak of gallons for gears: Add 20% by volume to any lube or oil fluid. Just $400+ $50 s&h= $450 total. Add $100 shipping for Canada/Alaska/Mexico for $850 total shipped to you. I'll email or call for $100 extra shipping approval. $400+ $50 s&h= $450 total. Add $50 shipping for Canada/Alaska/Mexico for $500 total, shipped to you. I'll email or call for $100 extra shipping approval. Price: $240+ $25 s&h= $265 total. Add $50 shipping for Canada/Alaska/Mexico for $315 total, shipped to you. I'll email or call for $ extra expense shipping approval. Please note: Mega Power works equally well in car, pickup truck, and generators, and industrial machinery. i'LL SHOW YOU THE INSTALL METHOD. It's simple to do. Fleet quantities and prices - tips, help, please call with your vehicle count. For Do-it-Your selfers, like the above picture shows, you can clean better, in minutes, what a mechanic is paid days to do. Mega Power works deep inside where even synthetic oils and other additives just can't go, and not possible before. See the details and how customer were glad they did the Treatment. Installing Mega Power...tractor additives Mega Power's new tractor additives solves problems in two steps, research has shown work. The products needed are made into a Treatment. The treatment product items and where they go. To help you, I give each ingredient a number and the directions to use them - as follows, to end your wear problem. Mega Power comes in gallon container sizes for easy usage. Step One: Pour one gallon Mega Power Fuel Conditioner into your fuel tank. Pour one gallon piston bearing valve and ring freer into your oil. Drive for a week. Then do and oil change. Step Two: After the oil change, add a gallon Mega Power Motor Treatment to your oil. Driving make Mega Power work to end your wear power decline problem. And in minutes, find your tractor beginning to run good as ever! we decided to guarantee your satisfaction of Mega Power, and its results, or return its cost to you - to entice more to try the Treatment - without risk - to check out results for themselves! Please note: 2 refunds last 267 days! Imagine that! Mega Power is what you need to end and prevent avoidable problems and should be your equipment and tractor additive. User experience points out that Mega Power will in a way, pay you - in saving tens of thousands of dollar in avoidable repairs, and to avoid years-premature replacement expenses. Order now without risk, below... But first.... More on Mega Power's tech side. Here's how the MP Motor "Treatment," as I call it, works. As you can see in the picture, many areas in your motor are cleaned - Fuel system, injectors, combustion area, emission system, oiling system - cleaning and freeing every ring, valve, and problem part from residue buildup - left-over from past oil changes. No other product can do as much! Why pay for less than what's needed? Two simple steps - and I'll show you what and how to do them. Step One uses Mega Power to start cleaning in your fuel system, goes on into the combustion area, getting top-side exposed manifold, rings, valves, combustion, and emission parts clean and free. The strongest cleaning scope of any product! Step Two Starts below a week later, during and oil change. 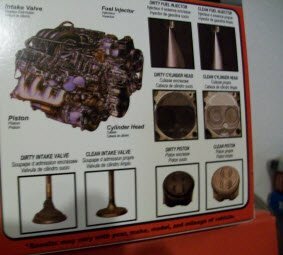 Adding Mega Power to your oil - now cleans your oil pump screen, oil passage ways, bearings, frees and clean your valve lifters, lower piston rings, piston skirts, valve stems, and smooths and conditions each parts, even your motor's gaskets and seals - to end those causes of your problem. All Complex - but complete. Running or Driving does the actual fix. Nothing to take apart. Mega Power friction modifiers your motor's part surfaces to work smoothly - again as the demo shows. Other advantages to end your tractor problem, explained below. There are 5 precise tractor additives & cleaners found to end your equipment wear, end power-loss, leak, and poor performance. End oil burning and blow-by motor problems. Restore compression & lost power, provide near like-new performance - it's true! That's what you get from Mega Power! Driving does the actual fix. One gallon Treats 5 to 10 gallon motor oil capacity. Add 1/2 gallon to oil now. Remaining amount 1/2 hour before an oil change..... Shipped to your door by FedEx in 3 days. Includes directions, tips, Guarantee, personal phone help. $400 plus $50 s&h= $450= Total for 5 gallons. State side. For 2 or more trucks, ordering. 10 gallons in 2 5 paks. $600+ $50 s&h= $650 total. Save $200. .
Price: $240+ $25 s&h= $265 total. 6 pak of gallons: Add as 10%, 15 to 20% if worn, by volume to any lube or oil fluid. $400+ $50 s&h= $450 total. $400+ $50 s&h= $450 total. Please note: Mega Power works equally well in car, pickup truck, and generators, and industrial machinery. Got Blow-by? Ending your motor's Blow-by Problem? These links note how effective Mega Power is in freeing your piston rings, to end combustion blow-by, and provide a return of loss power - stopping leaks in the process. Doing so with Mega Power's unique and strong, piston-ring cleaning and sealing ability. While your overhaul Cost can be thousands, Mega Power is less than $500 for its Mega Power Motor Treatment. There are similar prices for Mega Power's Transmission, Radiator, Power Steering, and Hydraulic System Problem Solvers - compared to the only other way... a $2000 to $4000 + over haul. That's my experience - and I'm a mechanic - I know Mega Power benefits keep your motor and those components running - for way less, restoring performance and putting off an over haul expense. In my simple Two Step Process I'll show you, your motor blow-by occurs, and will end so your motor will suddenly run quieter. It will then crank and start easier - even if sitting for months. That is because Mega Power end's piston ring expanding sluggishness, and stops valve sticking. Its anti-wear cleaners, and MC+ provide your motor with a strong valve closing action, again. Ending that and other problems. What's in a Mega Power Engine Treatment and its tractor additives to end your equipment wear, power-loss, leak, and performance,and oil burning motor problems? This what gets them running great again, avoids or puts-off repair. Two gallons Mega Power Diesel Motor Tractor Additive. One gallon Treats 350 gallons fuel. Add one quart to 50 gal fuel for freezing weather operation. Has pump lube, injector cleaner, carbon remover, and bio killer. Stops black smoke. Makes mositure burnable. Anti-wear. Otherwise, every 2nd or 3rd 50 gallons fill up. 10 gallons in 2 5 paks. $600+ $50 s&h= $650 total. Save $200. Add $100 shipping for Canada/Alaska/Mexico for $850 total shipped to you. Fleet quantities and prices - please call with your vehicle count. 50 gallon drum: $1,250 plus $150 s&h= $1400 total. Add $200 shipping for Canada/Alaska/Mexico for $1,650 total shipped to you. Call for current price. Stop Leak for oil or coolant leaks: $95 plus $15 s&h= $120 Gallon. Add $50 shipping for Canada/Alaska/Mexico for $170 total shipped to you. Stop leak for A/C seals. To revitalize hot-running, poor-cooling a/c compressor. $95 plus $15s&h= $120 Add $50 shipping for Canada/Alaska/Mexico for $170 total shipped to you. Specify for oil, fuel, leak, or for all when ordering. What other say about the for tractor additives. Same conclusion, below quoted, from Tractorlife.com/diesel-deposit-control web site. "Clean fuel injectors have always been an important means of insuring quality combustion. With changes in fuel injector design, this has never been more true. Not only are nozzle coking problems growing with more complicated nozzle geometry, but now newer engines face IDID problems as well. Newer generation diesel deposit control additives are already available in some premium diesel fuels and in concentrated bottle formulations that are capable of dealing with the most difficult IDID problems. And they are just as effective at handling the traditional nozzle coking problems. With fuel economy, power and emissions at stake, keeping these injectors clean is more important than ever, so when it comes to fuel injectors, you can’t be too clean." Mega Power is used as a tractor engine oil conditioner as well as a transmission, and final drive slippery-enhancing gear additive. Mega Power neutraulizes sulpheric acids growth in the component its added to. This one beneficial factor can double engine, transmission, and drive life. Matched up with Mega Power Diesel Fuel Additive in the fuel, Mega Power in the tractor diesel fuel, your tractor will start, run, and pull as if new again - or we will refund you their cost. Add 10% Mega Power to engine oil and 5% to hydraulic oil. Add 15% to transmission and differentials lube. Add one gallon Mega Power to each 300 gallons fuel, every 5th fill up, or once a month. Freezing weather, use one gallon every 100 gallons of fuel. Add one gallon to 100 gallons to clean dirty injectors. Then one gallon each 300 gallons fuel every month. $85 plus $15s&h= $100 Total. Add $50 shipping for Canada/Alaska/Mexico for $150 total shipped to you. Shipped to your door by FedEx in 3 days. Includes directions, tips, Guarantee, personal phone help. 6-one gallon 6 pak: $450.00 plus $25 s&h= $475 total. Add $50 shipping for Canada/Alaska/Mexico for $525 total shipped to you. 50 gallon drum: $1,250 plus $150 s&h= $1400 total.Add $250 shipping for Canada/Alaska/Mexico for $1,650 total shipped to you. Stop leak for A/C seals. To revitalize hot-running, poor-cooling a/c compressor. $95 plus $15 s&h= $120 Gallon. Add $50 shipping for Canada/Alaska/Mexico for $170 total shipped to you. ... Oilfield Application Additives. Same as above.